We moved into our home in 1985. 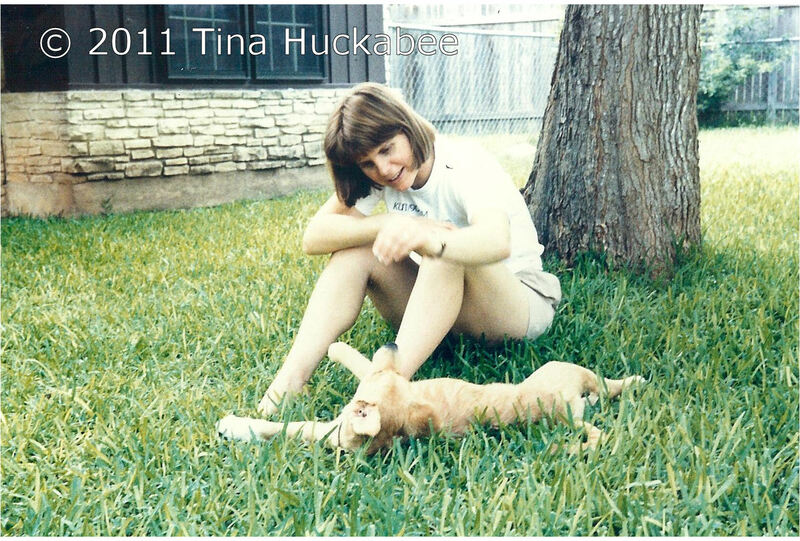 We were newlyweds, starting our careers and collecting dogs and cats along the way. The house seemed huge (it’s not) after college dorm rooms and apartment living. These photos are from the years 1987 through 1992. I inherited a property which consisted of two large areas of turf (front and back yard), two Arizona ash trees (Fraxinus velutina), an Eastern sycamore (Platanus occidentalis), two Chinese tallow trees (Sapium sebiferum), one bed of an unknown iris, unofficially called Shoshana’s iris, several hybrid roses scattered about the back yard and some Jackson & Perkins roses called, “Simplicity” (one of which is still alive). Mostly, though, there was grass. Lots of St. Augustine grass. 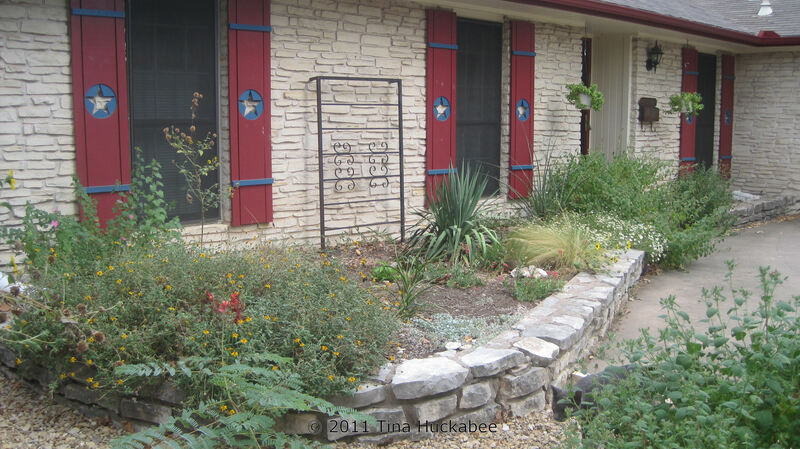 In the early ’90s, I developed an interest in native Texas plants because I wanted the blooms (without the work) and I wanted to attract butterflies, bees, and birds. 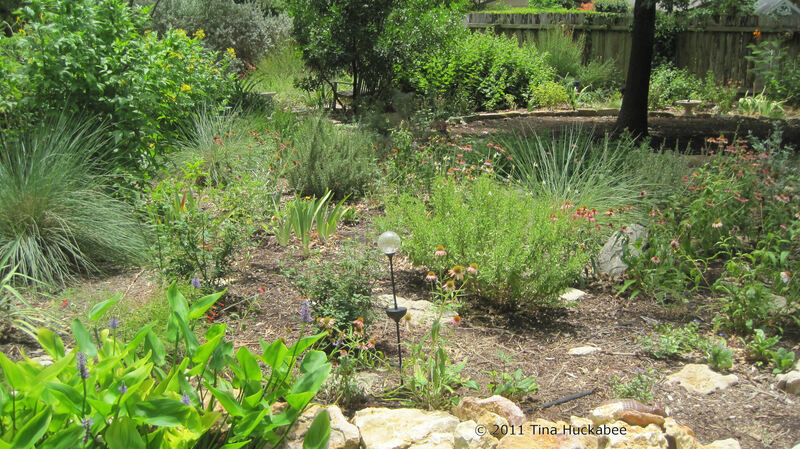 I’ve also planted well-adapted, non-invasive, non-natives, as many are great assets to a Central Texas garden. 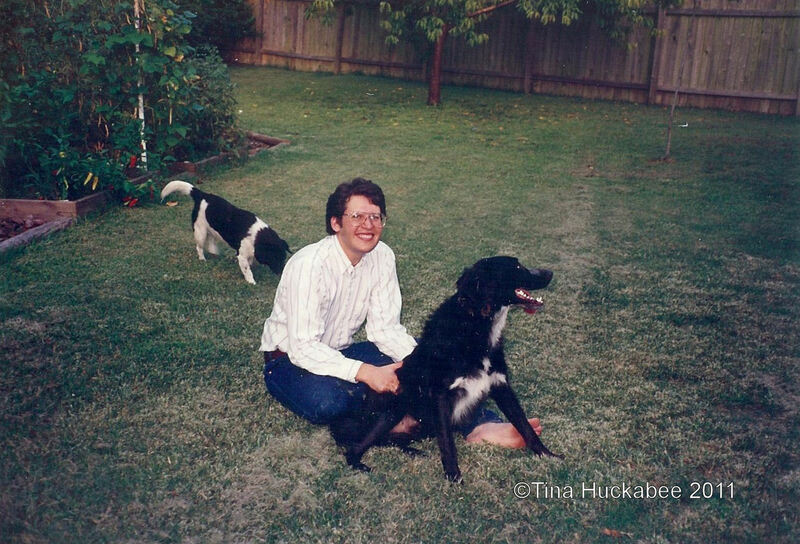 These photos are not great quality and the focus is on the dogs (okay, there is one of The Husband, too). 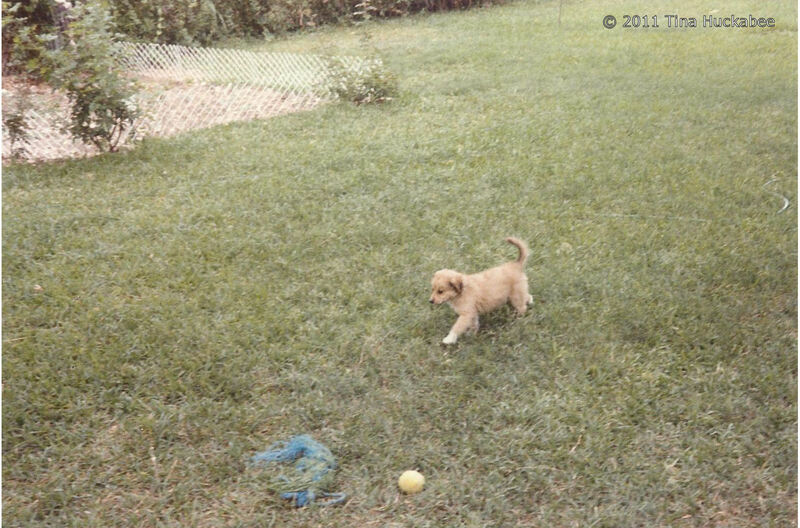 But you can see just how much turf I had–approximately 4700 square feet. At that time, other than the care of the roses and irises, the “gardening” I engaged in was mowing, edging and watering the grass. 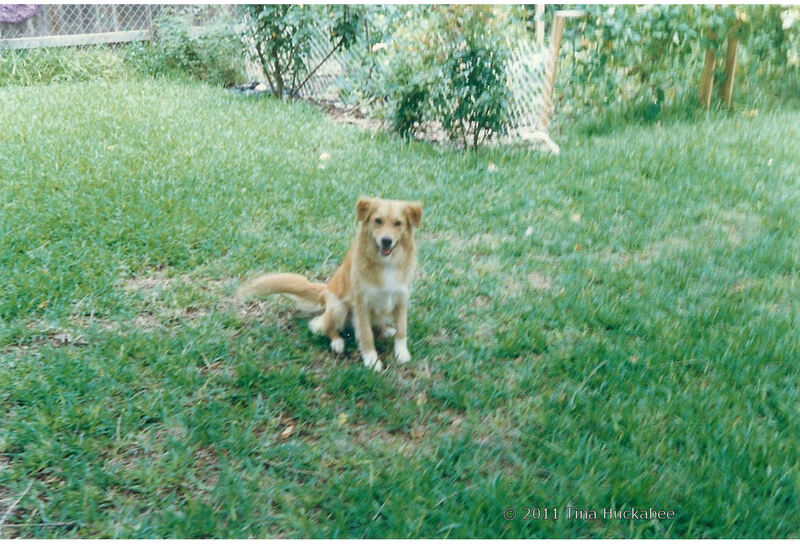 Note the sprinkler–this photo was taken in June 1991. I did have a vegetable garden during those early years and was quite successful growing the usual summer/fall veggies, as well as some culinary herbs. I experimented a little with some fruit trees. I planted an Ein Shemer apple, pear (don’t remember what variety), and Sam Houston peach tree. The peach tree was the only tree to survive longer that 2-3 years. It died in 2005. 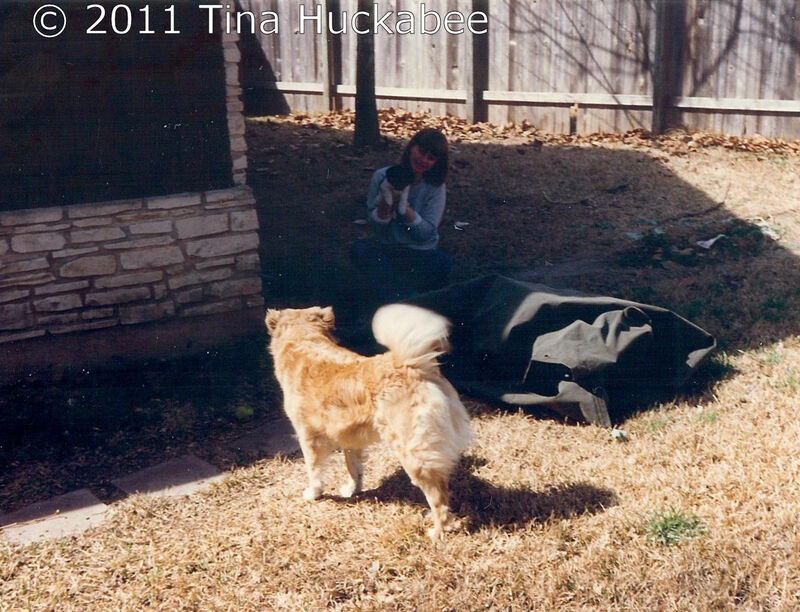 The two Chinese tallows died in a freeze in 1989 and we replaced them with two Texas red oaks (Quercus buckleyi). 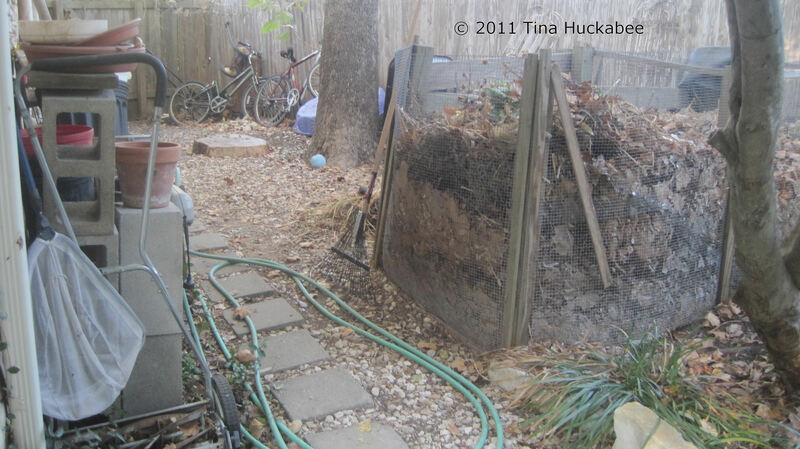 When I began this gardening adventure, I removed grass a little at a time. Initially, I installed one garden in the back yard and one in the front yard. My first little “native” garden in my backyard was a small patch next to my vegetable beds. 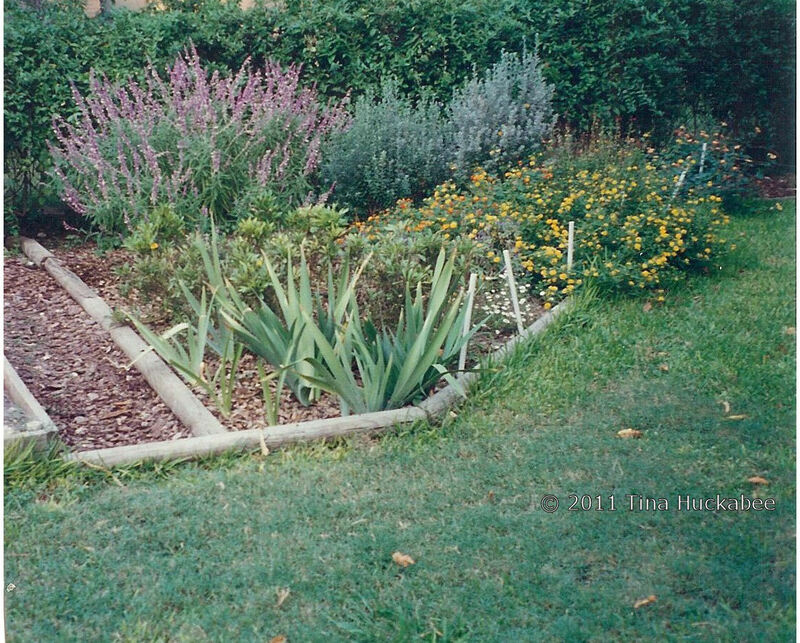 Each season, I expanded the beds and eventually developed perimeter gardens, leaving a teardrop shaped span of grass in the center part of the yard. By that time, I had two children and they played soccer, pretended they were horses, fought imaginary “bad guys,” and threw balls/Frisbees for the dogs in that area. We also built a playscape and that reduced some of our turf area. (The photo above is approximately the same shot as the photo with the mostly mowed grass and roses.) Once the playscape was no longer used, we set up some hammock chairs on the playscape beam and built a pond beside the sitting area. 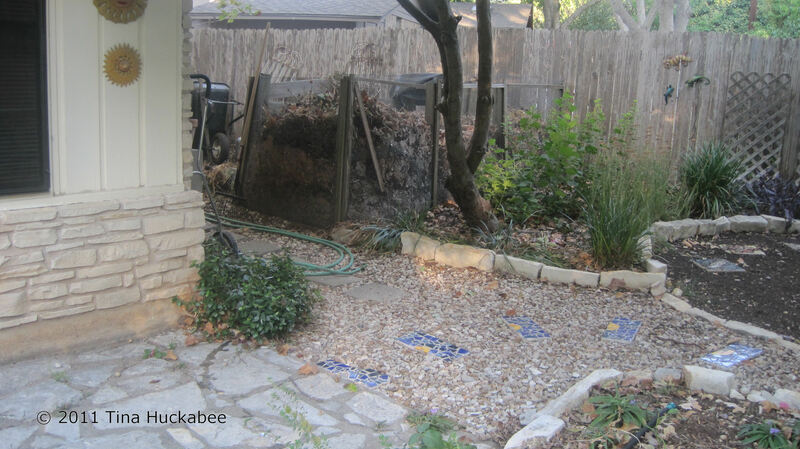 By 2008, I had removed almost all grass in the back yard and installed a large perennial garden with two large mulched areas and pathways throughout the back yard. There was a chain-linked fence which we removed within a year or so after we bought our home. After removing the chain-linked fence, we added a wooden fence parallel to the house line in the front, so the side yard is physically part of the backyard and is almost 600 square feet of area. Because of the dogs and the shade from the sycamore, this area was where the grass first died out. So, we have always used this area as a storage/work area. I store my compost there and we also have a clothes-line across the area. I store other gardening related materials there as well. Sometimes, the conditions for an area prohibit gardening and you just have to nurture other ideas on how to utilize a space. Currently, my plan is to build attractive fence and gate to shield this work area visually from the garden. I only have one photo that shows the front yard, but it was all grass with one Arizona ash in the middle of the main area (about 1200 square feet) and another alongside the driveway (almost 400 square feet). 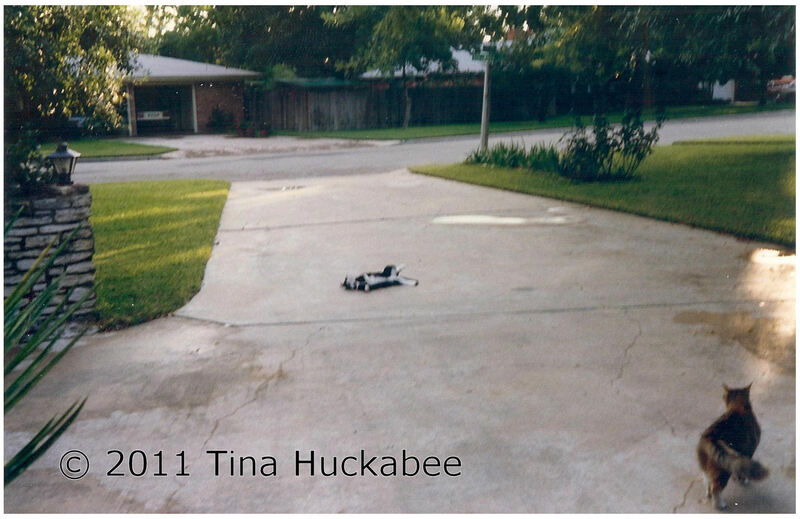 By 1998, I had removed the grass of the main area along the driveway and street and installed a large perimeter garden. Initially, there was grass (surrounding the ash tree), but after a cold, dry winter (2000?) in which I chose not to keep the grass well-watered, it died and I replaced it with a mulched area. I added chairs so that it was a place for relaxing and enjoying the garden. When my children were little, it was a good place to sit while they rode their tricycles/bikes and played in the front area of the house. It was (and remains) and area where I might sit with neighbors for an unplanned, casual visit. Back in ’85, the narrow area alongside the long driveway, which borders a neighbor’s home, was grass with a long, narrow bed of unknown irises bordered by some unknown hybrid roses. This is where I installed one of my first gardens. 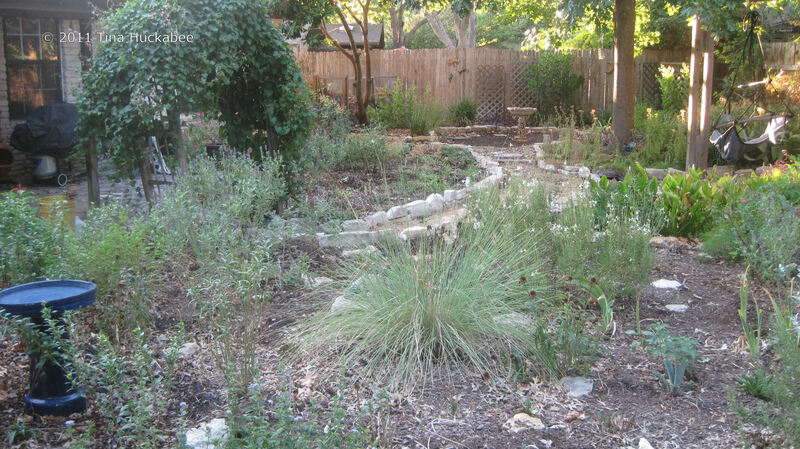 I gradually expanded the gardened area and as of 2008, the area was all perennial gardens and pathways. For many years, that area was the “basketball court” and I left some turf and had to choose plants that could withstand attacks from the basketball, as well as an assortment of other objects. As the basketball, soccer balls, tennis balls, etc., made fewer appearances, I’ve been able to diversify the plantings–rid myself of the troublesome grass and add plants that I want. 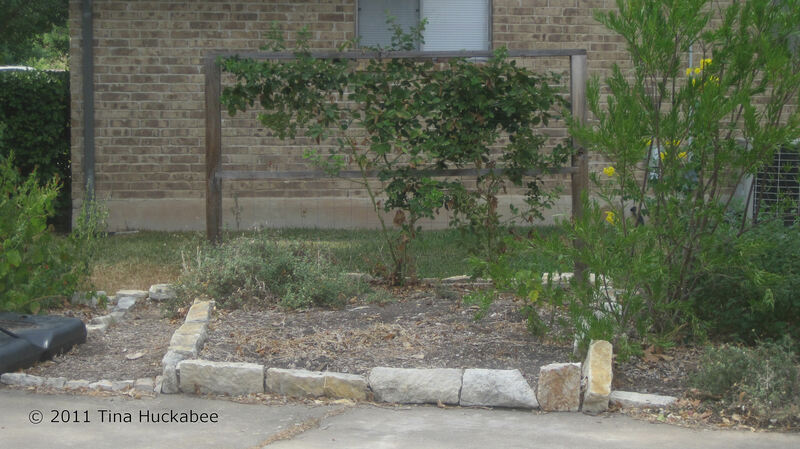 In 2009-10 I also added a small vegetable garden with a Rosborough Blackberry vine (Rubus, sp.) since that area receives full sun. Lastly, directly in front of my house is a raised bed. I’ve had a variety of plants there as conditions changed over the years, but it’s always been a difficult area to garden. Until the large Arizona ash was removed in late 2005 (because it split and was a danger to our roof), it was a shady garden with Western exposure and was buffeted by the driveway. Because it’s in the front of the house, I’ve always wanted it to look more formal, but I’ve never wanted to pamper the area any more than any other part of my gardens. The bed now receives full sun and in winter of 2010-11 I finally removed plants that I wasn’t completely happy with. 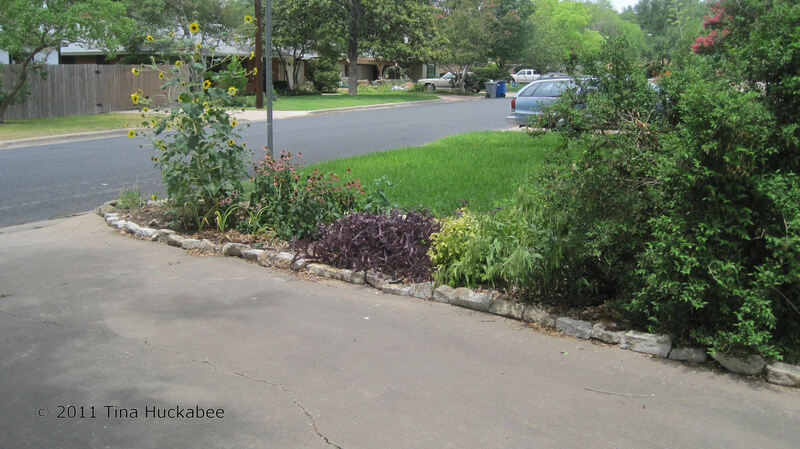 It is now planted entirely with native Texas plants. Off and on over the years, I’ve had periods of time (because of a busy schedule) where I did no more than basic winter/spring maintenance and occasional summer watering to maintain my gardens. 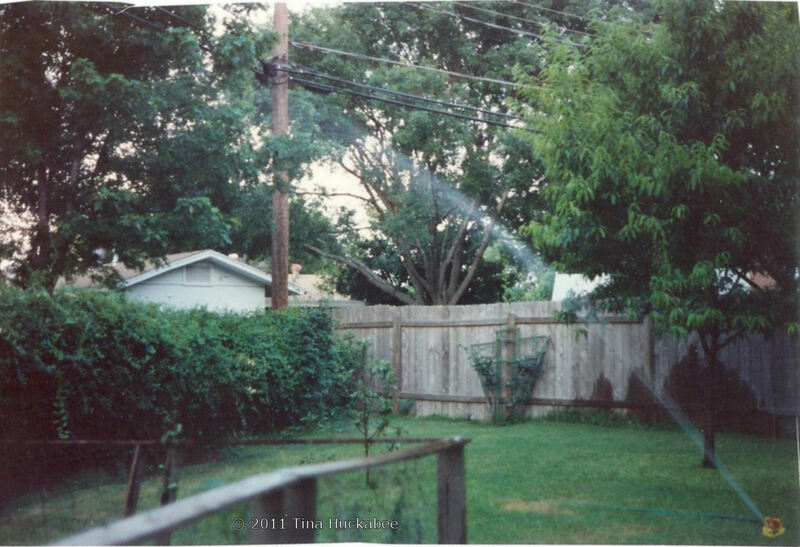 For irrigation, I have placed soaker hoses in all of my gardens–no sprinkler system for me. As a general rule, unless I’m adding a new garden/pathway or re-landscaping an existing garden, my workload is not that great, certainly no more than when I had grass as the primary plant on my property. More importantly, the main part of my work occurs during winter/spring, rather than the mowing/edging/watering schedule that grass demands in the summer. That is no small consideration for those who endure the hot, Texas summers. 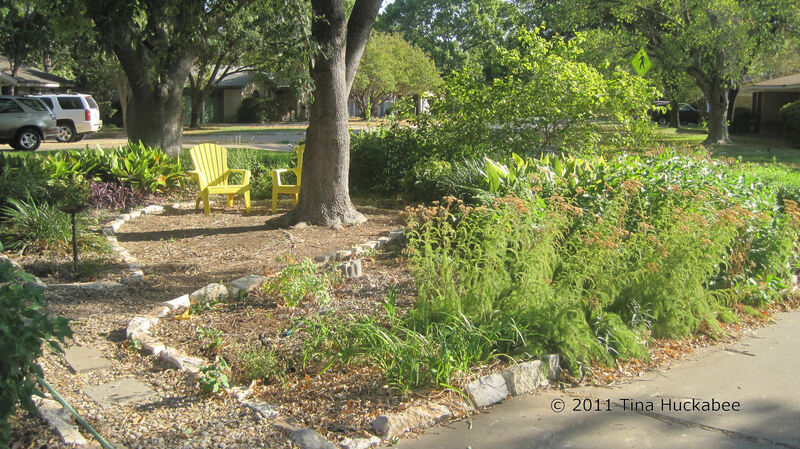 In August 2010, I undertook a re-landscape of all of my gardens. Lousy timing, I know considering that we’ve endured the worst single year drought in Texas history! But, it was time to freshen my gardens, mulch the areas where I let my grass die and extend some of the existing gardens. As of September 2011, I’m still working on this project and my landscape will require some tweaking. However, I’ve generally been pleased at my progress. I’ve planted only tough, Texas natives and lost few plants over the course this hateful, hellish summer. My water bill is still a fraction of what neighbors with St. Augustine grass pay. I hand water daily when I plant something new (for a week or two), then ease off the watering schedule. During the summer of 2011 I’ve watered once/week because I’ve added new plants to almost all of my gardens in the past twelve months. Some of my gardens can go two/three weeks without watering. My established gardens (gardens with no new plants) get watered only once/month. What a transformation, Tina! I saw that you had roses “in the early years”…do you still have roses in the back? I still have roses, more in fact. Those roses were all Jackson & Perkins. The only one whose name I remember was the huge red rose, ‘Proud Land’. It was an absolute beauty and fairly hardy. Eventually, those all died, though. Now, I have two ‘Mutabilis’ Roses, two ‘Martha Gonzales’ roses, one ‘Old Gae Hill’, one ‘Knockout’, one ‘Caldwell Pink’ and recently, I planted a ‘Belinda’s Dream Rose.’ Except for the Knockout, all are antiques. I’ve enjoyed all of them-even in the drought and heat, all are looking good. Thanks so much for the story and photos of your garden! I’m just beginning what I hope will be a similar journey–converting our St. Augustine lawn to all native and well-adapted plants, mulch, crushed granite and pathways/hardscape. It’s amazing how much bigger and more inviting it looks when it’s all gardens! Hey, I just might start that blog. I guess I’d better round up some before photos. Thanks again! It takes time. Just enjoy yourself with the garden and have your daughters help–they’ll be great helpers until they reach puberty…. I noticed that you had Nandina’s at one time. What is your opinion of trimming them after the deer have eaten all the leaves off of them on the front side, the back is still green with some color. The front is so bare. I am heart broken I have had them for 17 years and never has this happened before. Hi Jackie! I do have Nana Nandina, but only in the front garden and I don’t have deer. Dealing with deer is tricky and I can only give you advice that I’ve heard other people give. If the stems/branches where the deer munched the leaves are green, I’d leave the plant alone. It’s more than likely that leaves will flush out as the temps warm. You might add some compost or something gentle as a feed to the Nandina, but I wouldn’t do anything else. I don’t think I’d prune the Nandina. You also might fence the plant. That’s a drag, but if the deer found it once, they’ll find it again, so you’ll have to protect it. There are also deer resistant sprays on the market, but I cannot vouch for their usefulness. Another thing you might do, depending on your situation, is to plant some truly deer-resistant plants/shrubs around the Nandina: lantana (all kinds, but especially the native with the orange/yellow flowers–Lantana urticoides), Rosemary, any of the larger salvias (S. greggii, S. coccinea, S. leucantha, etc. ), the theory being that very aromatic plants will repel deer. It doesn’t always work, but it might. I wish you the best! This growing season will be our 4th owning this property in Pennsylvania (zone 5/5). I have taken pictures as you did to document the changes, and I plan to share the experience as you did. We have nearly a foot of snow on the ground and are expecting more Sunday and Monday. I torture myself looking at garden sites in these conditions, but I at least use the time to research and plan. Thanks for being a resource! I can’t even imagine a foot of snow. But you’re absolutely correct that now is a good time to plan and strategize on what you want to do with your property. I read that you have 80 acres–nice!! As far as being a resource, I’m flattered and hope you can learn from my experiences, but we garden in very different areas. Still, I really enjoy reading about and looking at what gardeners from elsewhere do and there’s always something new to learn. A labor of love, I assure you! You could try killing your grass off, a bit at a time. Use newspapers and/or cardboard from boxes. Lay it down, mulch over and leave for a season. Then when you’re ready, cut through the mulch and then the paper/box material (with a boxcutter or knife of some sort) and plant. If you have a big lot, it might take you a few years. Okay, a lot of years (:)) but if you’re planning to live where you are for a long time, that might be a good strategy for you. Best of luck with whatever you decide. Ha–I certainly appreciate the havoc those birds make when they’re searching for stuff to eat. Wonderful. To have such an open front garden here in most parts of South Africa would be regarded as sheer lunacy, as nothing not ”nailed down” would be gone in the blink of an eye. Aside from the occasional property already within the confines of a designated enclave, every house I am aware of has a front wall. Our property is split level and the bottom half, which sits behind a relatively low wall, we have pretty much let go wild, (aside from a single, narrow designated path to the municipal electric box) and is full of creepers and cosmos etc. Many of the plants we have discarded from the top garden have taken root in their new home. We also planted cacti as a natural burglar deterrent. It serves its purpose now the cacti have established themselves. I too would dearly love to reduce the lawn to something akin to a postage stamp but the wife is quite adamant it remains as is. Even my feeble attempts at making extra beds are viewed with deep suspicion! Maybe I could get her to compromise and suggest Astro Turf? I don’t worry too much about vandals, so I suppose I’m fortunate with that. It sounds like you’ve created an nice pollinator and wildlife friendly habitat around your place. As for the turf-loving spouse, keep working on her–maybe she’ll relent and let you garden the whole deal!